Grim Facade: Monster in Disguise is rated 2.9 out of 5 by 13. Rated 5 out of 5 by denniann2 from i liked it but others evidently didn't there is a custom level and hint system is good. this is a sequel in the grim facade series. it was ok. i will get the next one and yes, it will have another one since the end of this one has already set it up. you have been brought in to help with a murders that happeniong in the city. they have arrested one man for it and you have determined he is innocent. you need to prove his innocence. they are saying that "bloody stanley" is actually the person that is murdering people and it is connected to an orphanage that had operated in the past. Rated 5 out of 5 by biscuitsmama from IS BLOODY STANLEY BACK? Your first day on the job could turn out to be a brutal one – at least this is what it seems like. In this newest game in the Grim Façade series you are the new detective in town and have been tasked with investigating the latest murder in a recent string of killings perpetrated supposedly by someone dubbed as Bloody Stanley. A local man has been convicted of the murders but he’s on death row awaiting execution and the police captain is beginning to wonder if they have the wrong man in custody. 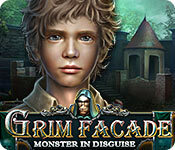 Jump into this new Grim Façade to find the killer and help save an innocent man from meeting an untimely end. Everything about this five-star game is top quality from the graphics to the sound package. One thing I like is that in the custom level the hint and skip buttons work independently. As with the other Grim Façade games you will find coins to be used to purchase needed items from the local street vendor. Dare I even mention the word pet helper? Even though he isn’t a pet helper, that scraggly cat with attitude – Death – is back and, in this case, he is a welcome addition to the game. The HOPS are excellent, varied, and interactive. IMHO, these are some of the best HOPS from this developer who seems to have recaptured some of the creativity that once had it as the leader in casual games. I enjoyed the first HOP that is interactive and quite a bit of fun. The mini-games are excellent and some of them required a bit of thought to solve. My favorite is the very first mini that involves placing various shaped tokens into a panel according to shape. It is not difficult but it is tricky as you can easily get stuck. All in all I am impressed by both the HOPS and the mini-games. I Enjoyed this game and purchased it almost immediately. The storyline is interesting and before the demo ended I had seen enough to know that this is a great addition the Grim Façade series and is even better than some of the older games. Even though I am not a “cat person” there is something about the scraggy and beat-up feline that I like. IMHO, this is a very good game that took me some time to complete. Please try the demo to see if it is a game you will enjoy as well. Rated 4 out of 5 by rpggramma from Good Game, Story! I enjoyed it! The story was good, but endings are abrupt. Puzzles were better than most; different and some challenging! Not too gory except for a few scenes. Story was told by movies, which I did not care for, bc, I didn't understand what they were trying to tell me until later into the story. Had trouble with the evidence work, as well. Collected it, but didn't know what to do with it!? Kept trying to put it with some files that kept popping up, police file, prison file?! And who is Emmy?? Rated 4 out of 5 by PATinPNS from The Monster Gets His! This is posted after playing the entire game. I really enjoyed this one. Wasn't really sure what to expect, but I got hooked on the demo and realized it was a buy for me. I enjoyed about everything in this game, with the exception of those blessed mini games. Wow, they kicked me hard. Graphics and sound were excellent. Voice overs were very well done and the effects along with the music went along with the story. I rated the level of challenge 5 stars, because I realize I'm not the brightest bulb in the box and there are players who will find them to their liking. Most of them I couldn't figure out what in the world to do. I hate those things anyway, but when I can't understand the premise it's over before it gets started. Yes, I used the custom setting and had a quick hint and skip button. Hidden objects were varied and some were very challenging. They ranged from the list to silhouette to combinations, and others. They did keep my entertained. The story was really interesting. I thought in the beginning it was going to be the tired old ghost story, but was pleasantly surprised with how it was put together and progressed. The game seemed short to me. However, if I had played those silly mini games it would have been much... MUCH longer. If you are a mini game lover you're going to love this game. There seemed to be a good mixture of hidden object and minis and was the most challenging I've played in a long time. Give the demo a try and I think you'll enjoy this one as much as I did. Rated 4 out of 5 by pennmom36 from Slightly More Entertaining After The Demo Originally I was going to pass on purchasing this game because it just wasn't that exciting to me. I decided to take advantage of the sale offered yesterday, and threw this game (Collector's Edition) in for the discounted price. It does get slightly better after the demo, mainly because of the Mini Games offered. I played the demo of this Standard Edition to be able to compare the versions side by side. In my opinion, this Standard Edition is the better choice, unless you want to collect fake gold coins that aren't hidden at all, to purchase make believe knives from around the globe. This is a fairly easy game and I saw no need to use a Strategy Guide which is also included in the Collector's Edition. I have included my review from the demo as well as some features from the other chapters. (5 Chapters total plus Bonus Chapter) Hank Williams has been arrested for the gruesome murders that have occurred recently. This serial killer has been dubbed "Bloody Stanley" and he's scheduled to be executed, the town can rest easy now that he's behind bars....or is he? Seems like Hank may be innocent, because there's been another murder with the same MO! You're first day as detective is going to be a doozy, not only do you have to prove one man's innocence, you have to find the real murderer, before yet another name is crossed off his list! The graphics are fairly decent, but the storyline is getting old. The storyline waivers a bit from a serial killer to paranormal once you find an Orb that can detect 5 memory fragments floating throughout some of the scenes. Once you have caught all 5, a ghost will appear to show you something very important that will help your investigation. As you scour the town for evidence and clues, you will come across several silver coins that are used to purchase miscellaneous items from a shady back alley vendor's trench coat lining. These coins are also used to pay the coach driver for each new location (or chapter) he takes you to. These coins are not to be confused with the collectible Gold Coins that you find and use to buy Knives from around the world such as the Tanto a Japanese sword, the Kukri a machete from Nepal and the Sgian-dubh a knife used with the traditional Scottish Highland dress. (Gold Coins are only available in the Collector's Edition, most coins are just laying in plain sight within the zoom zones) That's all fine and dandy, but I don't get this feature at all, who cares about fake virtual buying? I'd rather find the knives themselves as a collectible or better yet, a morphing knife object. 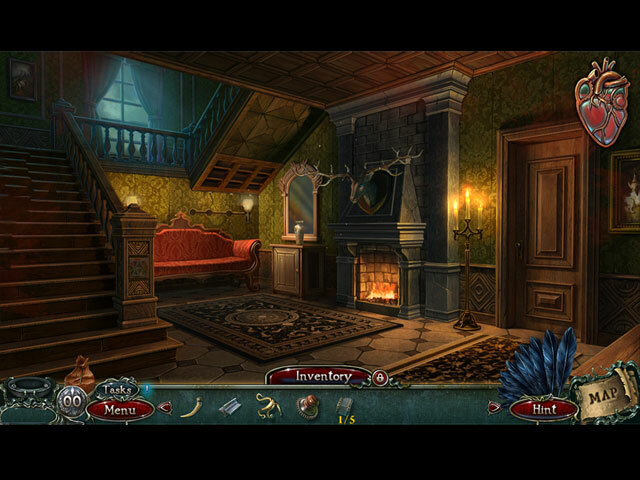 The Collector's Edition also has Collectible Skull Masks, within the Hidden Object Scenes. (again, they are not hidden, they are just laying out in plain sight, and the cursor changes to a hand which makes it even easier to spot) Whenever you speak to other characters, you are given several conversation options, usually one straight to the point option, one slightly introverted, and one slightly sarcastic. When I played this SE version, I chose different questions to ask and I got the same response. The CE also has Achievements to earn, the only ones I was impressed by told you how long it took you to finish a puzzle or HOP. Both editions have the usual Plus Sign inventory items, some of which require you to solve a puzzle which is kinda cool. 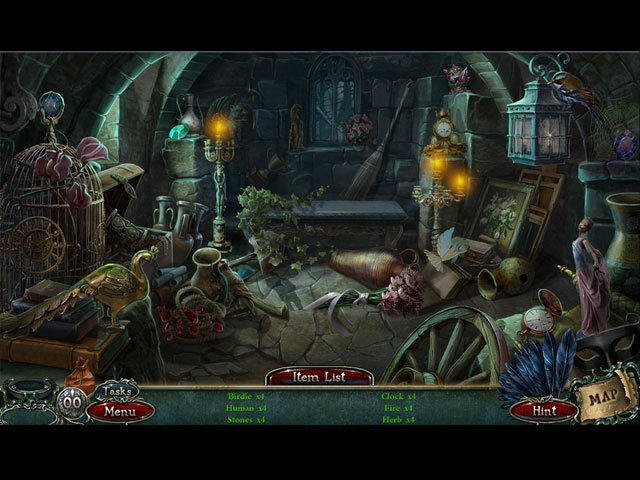 The Hidden Object Scenes lack imagination and are all basically the same, usually Interactive List Finds with some multiples of the same item, followed by Silhouetted Shape Finds. There are also smaller Zoom Zone HO's where you need to find 4 fragments of a particular object. In the Collector's edition each Hidden Object Scene has a brightly colored collectible skull mask to find, but I have no idea what the mask has to do with the storyline. My biggest disappointment with this game came with the realization that many of the scenes are repeated, this is a feature I despise, it's just too boring the second time around, even more so when it was boring the first go round. The Mini Games aren't bad, they start out in the demo kind of boring, but really do improve afterwards. Below are brief descriptions of some of the Mini Games you'll encounter during the demo, and a few of my favorites after the demo: 1) Place flower tokens of different shapes on the board so that they fit together. (one of my favorite games) 2) Catching memory fragments using your Orb ghost catcher each time it's used by clicking on each floating orb until the orb indicator is full. 3) Move the silver token to the empty silver space on the board. Move the gold chips to move the frame and create a path for the silver tokens. 4) Move the silver chip to the empty space on the plate using arrows to rotate the disk. 5) Navigate the buttons and open the blockers with tools you find in a labyrinth. This was my favorite puzzle because the labyrinth was made up of hedges and stone walls and was covered in fog so you couldn't see openings, you had to move the character a little at a time, and hit dead ends a lot of times. You come across obstacles such as locked gates, or even a beehive that require you to explore every inch of the maze to find things that will help you such as, keys to open the gates or a smoker to calm the bees down long enough to walk past them! 6) Swap lock "teeth" on the bottom rail, press the check button to expose the top rail of teeth until the bottom teeth fit snugly into the top teeth. 7) Get all the color coded bugs to their final color coded positions. Bugs will move until they hit an obstacle or another bug, 8) Move the puzzle parts to their final positions, puzzle pieces stick to each other. The Collector's Edition has 9 replayable Mini Games. 18 replayable Hidden Object Scenes, 22 Movies, 4 Music Soundtracks, 5 Screensavers, 9 Wallpapers, 11 Concept Art pictures, 17 Achievements, 11 Collectible Masks, 15 Knives from around the globe to purchase with Collectible Gold Coins, a built in Strategy Guide and a Bonus Chapter, enjoy! Rated 3 out of 5 by ninja226 from Good story, but violent with abrupt ending My only complaint about this game is it's about a killer who murders in a violent, gruesome manner. Not my cup of tea. I don't think it would be suitable for younger players. The suspense and build-up is skilfully done, but ending is abrupt, as a segue to the bonus chapter. The mini games can be played easy (Casual) or Hard, and they are hard, unless you're a genius I guess. Some of the puzzles I found difficult to solve because the instructions and/or the set up is just so weird or non-intuitive. This is one installment in the series I did not really like. I like mystery, but not violent mystery. Rated 3 out of 5 by BooksandGameFan from Not the best and not the worse of the series. I enjoyed this game, but I did start to get a little bored towards the end. As usual the graphics are perfect if not a wee bit darker than normal, which is something I actually prefer. The hidden object scenes were great and interactive, the games where fun and challenging without being unnecessarily time-consuming. All and all I had fun and I would definitely recommend the game! Rated 3 out of 5 by deddu from MONSTER IS RIGHT Let me first say that I have played almost all games in this series, but this one was somewhat disappointing.It has a warning that it might be too violent for some -- you witness one murder. However,I really didn't care for the hidden objects as you go back to the same ones several times for other items. 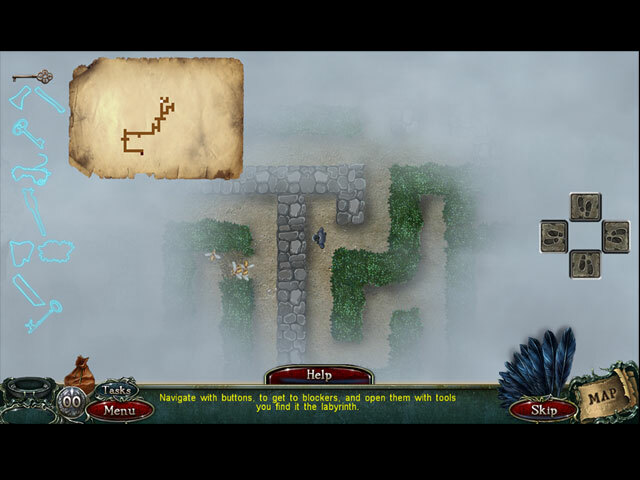 The one puzzle I really enjoyed was the labyrinth -- it is filled with smoke/fog, stone walls and hedge -- you must guide the figure around to find objects to leave the maze -- very well done. Rated 2 out of 5 by netty2327 from gone with a blink of an eye!!!!! just love these games but it took me all of 2 hours to finish it, really disappointed with the game!!!!! !